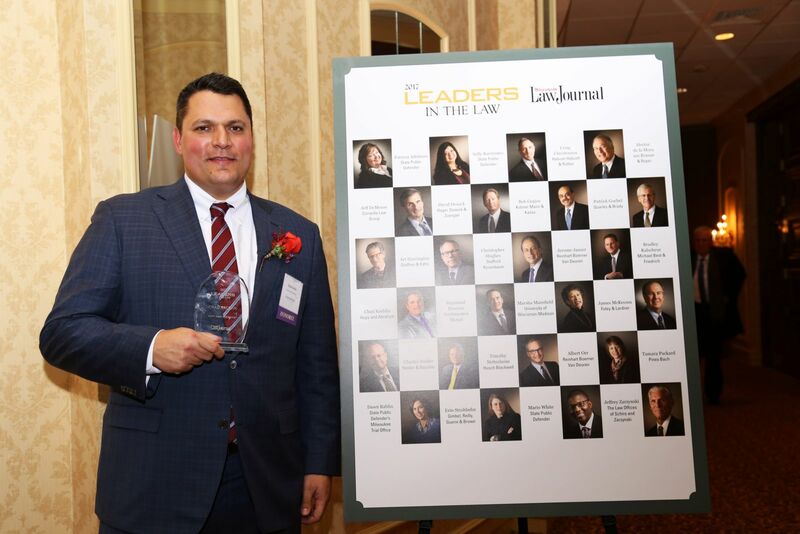 Attorney Chad Kreblin Named a 2017 Leader in the Law | Hupy and Abraham, S.C.
Hupy and Abraham, S.C. shareholder Attorney Chad Kreblin was honored by the Wisconsin Law Journal at the 2017 Leader in the Law event. On February 16, 2017, members of the Wisconsin legal community gathered at the Pfister Hotel in Milwaukee to celebrate the 24 honorees. Each year, the Wisconsin Law Journal recognizes attorneys across the state, due to their outstanding legal expertise, leadership and integrity. Attorney Kreblin has maintained those standards in his work at the firm, and in the community, throughout his career. A graduate of Denver’s Sturm College of Law, Attorney Kreblin has practiced personal injury litigation since his graduation. He has tried many cases and received over $140 million in settlements for clients over the years. He has consistently been honored by legal institutions and organizations for his excellence as a practicing lawyer, including a placement on Super Lawyers’ “Rising Stars” list for six consecutive years. In addition to riding his new motorcycle in his spare time, Attorney Kreblin has spent his moments outside of the courtroom working toward bringing awareness toward child identification. As the creator of Hupy and Abraham’s child identification fingerprinting program, he has personally fingerprinted over 10,000 children. Attorney Kreblin’s hard work has not gone unnoticed, and all of us at Hupy and Abraham, S.C. are extremely proud of this well-deserved honor.